This section provides useful and essential information about life in Cyprus and what to expect when purchasing property. From the scripts of ancient Greek poets to modern tourist brochures, Aphrodite has been almost synonymous with Cyprus throughout history. Variously known as 'Kypris', the Cyprian, and 'Paphian', after the town of Paphos from where, mythology has it, she rose from the sea-foam, the goddess of beauty and love is above all a Cypriot goddess. Visitors catching their first glimpse of the island from the air will not immediately recognise the dry and barren countryside on the approach to Larnaca airport as the object of Homer's verse - especially in summer. Situated in the eastern corner of the Mediterranean, Cyprus has a subtropical climate. In July and August temperatures rise to over 40ºC, in the central plain, leaving the land parched and the island a blaze of brown and dusty-gold colours. Only the green leaves of the hardy olive, carob and fig trees break up this auburn kaleidoscope. The most prominent features on the island are two mountain ranges which started off life as molten rock erupting from the ocean bed. The higher of the two is the southern Troodos range, which climbs to an altitude of 2,000 metres above sea level and in winter it is covered with snow. Because of its vulnerability to the elements, the sedimentary cap of limestone and sandstone covering the Troodos mountains was washed away exposing a range of igneous rocks. These contained easily accessible minerals - such as copper, asbestos and pyrites - which, for thousands of years, constituted the island's main form of wealth. The other mountain range is the Pentadaktylos (five fingers), which rises from the northern coast of the island. The Pentadaktylos range has retained its limestone covering over the ages. The two mountain ranges were originally separated by a shallow sea, the bed of which is now the Messaoria (or middle) plain - a fertile agricultural region with the capital city of Nicosia situated at its centre. Picture used with permission from the Cyprus Tourism Organisation. For more information, please visit their website. 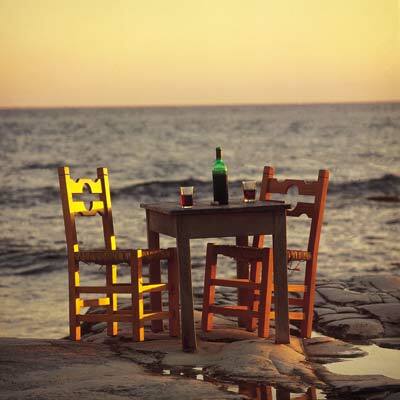 Over the centuries, the traditional local welcome to guests is "kopiaste", Greek for "come and join us" - but the spirit has always been the same. During its 9000-year history the island has been host to a long list of dominant regional and world powers from the Romans to the British. Modern Cyprus bears all the hallmarks of a historical melting pot, as reflected in the diversity and richness of its culture, architecture and traditions. History has also shaped the composition of the island's present population. Early in the 2nd millennium BC Myceneans and other Greeks settled in Cyprus and gradually assimilated the local population turning Cyprus into a culturally Greek island. Since then and despite the various influences that Cyprus has been subject to, the character and culture of the place has remained Greek, 80 per cent of Cypriots are Greek and the second largest group accounting for 18 per cent of the population, is the Turkish Cypriot community. The people of Cyprus owe their individuality and warmth to the fact that they are the product of an amazingly colorful history. This sun drenched island has been at the crossroads of world events for centuries. Roman, Byzantine, Greek and British influences (to name just a few) have all had a bearing on life in Cyprus. Perhaps that's why Cypriots have a special knack of making visitors feel at home as soon as they step off the plane or ship. That warm welcome, plus the unhurried pace of daily life, makes Cyprus an instant favorite of anyone who goes there. The island nation is a fascinating land of contrasts. It has some of the most sophisticated cities in the region, and yet, a short distance away, you can feel as if you have stepped back into a previous century, not just the 19th, but far back to a time when people pursued simpler pleasures. Drop into almost any country taverna, or join the locals at a town market, and you will feel the atmosphere of a way of life that has remained essentially the same for centuries. The island has proved irresistible to many famous historical personalities, such as Cleopatra, Alexander the Great, Leonard da Vinci and Richard the Lion Heart. When Richard freed his imprisoned bride-to-be, Berengaria of Navarre, in 1191, Cypriots all across the island seized on the opportunity to have a party! Cyprus may be a small country, but it's a large island - the third largest in the Mediterranean. And it's an island with a big heart - an island that gives its visitors a genuine welcome and treats them as friends. With its spectacular scenery and enviable and enviable climate, it's no wonder that Aphrodite chose the island as her playground, and since then, mere mortals have been discovering this "land fit for Gods" for themselves. Cyprus is an island of beauty and a country of contrasts. Cool, pine-clad mountains are a complete scene-change after golden sun-kissed beaches, tranquil, timeless villages are in striking contrast to modern cosmopolitan towns, luxurious beachside hotels can be exchanged for large areas of natural unspoiled countryside, yet in Cyprus all distances are easily manageable, mostly on modern roads and highways-with a secondary route or two for the more adventurous. Most important of all, the island offers peace of mind. At a time when holidays are clouded by safety consciousness, a feeling of security prevails everywhere since the crime level is so low as to be practically non-existent. From the top most point of Mount Olympus to the coasts and sweeping plains, Cyprus is nature's island. Many exquisite wild flowers grow in splendid profusion in springtime. Trees, shrubs and plant luxuriate in the Mediterranean sunshine all year round. Bright bougainvillea blazes vividly against white walls, reflecting its splendor in the crystal clear waters. Cyprus is also prized for its bird life, and the migratory birds that use the country as a stopover are eagerly awaited between seasons. Due to the wonderful climate and variety of scenery, the island offers endless opportunities for nature lovers and outdoor sports fans. Activities such as angling, mountain-biking, hiking, gliding, golf; sea-sports and yachting are but a few of the special activity holidays that the islands offer. With so many possibilities, Cyprus is a bird watcher's paradise, an archaeologist's heaven and a photographer's dream. It is probably no surprise with a history so long, that Cyprus is remarkably rich in culture. 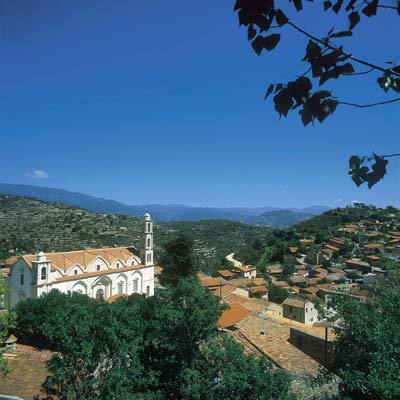 UNESCO has honored its importance, which were included nine of the island's Byzantine Mountain churches and the entire town of Kato Paphos in its World Cultural Heritage list. Wherever you tread in Cyprus you are reminded of a strong tradition that it's kept alive from generation to generation through the many events which are celebrated. Hardly a week goes by in Cyprus without a celebration of some sort, whether it is a colorful festival or homage to a saint on one of the numerous "name" days. The "panigiri", a traditional open-air fete, takes place mainly in the villages on the occasion of a saint's name day. Easter, the most important Greek Orthodox religious event, is celebrated with solemnity, joy and hope. Carnival is one of the best known Cypriot celebration, along with "Anthestiria", the spring flower festival and "kataklysmos" - the festival of the flood - which coincides with Pentecost. Throughout the year there are also exhibitions, concerts, drama and folk festivals. Cypriot culture is also reflected in the rich folk art of the island. Age-old crafts, handed down from one generation to another, are faithfully carried on to this day by skilful hands and nimble fingers, fashioning handicrafts, both decorative and useful, that would grace any home. The Greek Orthodox Church has been the mainstay of religion in Cyprus since the 1st century AD, and in a society where the church continues to play an important role, old style values have maintained and the family unit retains close-knit qualities that keep colorful customs alive, and underline the warmhearted character of Cyprus. So, Cyprus has won you over with its subtle charms and you've decided to settle on the island of Aphrodite. 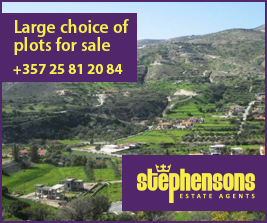 It's hardly surprising that so many people choose to make Cyprus their new home. The hospitality of the locals, the outstanding climate, the relaxed way of life... Cyprus has lots to offer, and given its favourable position, it's easily reached from just about anywhere in Europe. So much to offer means so much choice, including where on the island to settle. 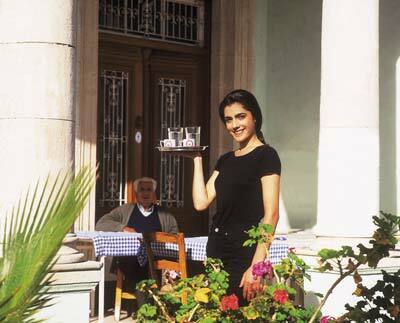 Lefkosia (Nicosia) is the island's cosmopolitan capital and a thriving blend of modern business and old traditions. 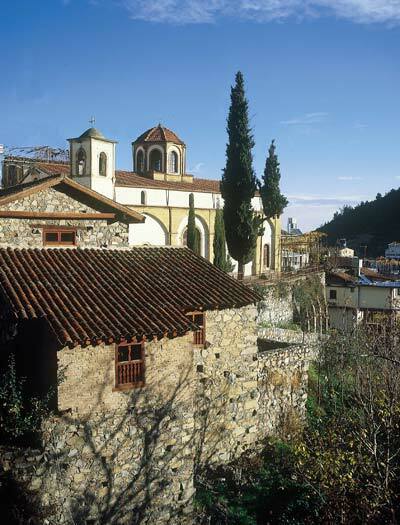 A bustling city, Lefkosia typically attracts business people and those looking to enjoy city life. For retirement, ex-pats tend to look to the resort towns, where facilities are good and the cool blue of the Mediterranean is never far away. Pafos, Lemesos (Limassol), Protaras, and Larnaka are the major coastal towns in Cyprus, and are all home to substantial ex-patriot communities. A wide variety of properties and facilities are on hand to ensure that life 'abroad' is never a hardship. Summer temperatures also tend to be lower in the coastal areas - a very real consideration for those coming from cooler climes. In recent years, a growing number of newcomers are choosing to settle away from the larger towns and make their homes amidst the quaint charms of the Cyprus village. The reasons for this become immediately apparent when one visits a village - be it in the upper reaches of the Troodos mountains, or close to the sea. The pace of life is so laid back it almost stands still. Visit any village, and you can almost guarantee that it will be a peaceful place. The working day starts early, so don't be surprised if you don't see too many people around during the day as the locals will be out working in the fields. Bedtime is typically early so, as you can imagine, there's not too much in the way of hard partying! Unless there's a wedding, of course, then the whole village bursts into life! It might all appear idyllic, but don't be fooled. Times may have changed, but many villagers still work hard, tending their crops and small farms. Local produce like carobs and grapes are still collected and sold, and fruit and vegetables are still taken to the market. Most rural families also have their own citrus grove. Cyprus is unique when it comes to the taxation aspects of living on the island. Cyprus has conducted treaties for the avoidance of double taxation with: Austria, Bulgaria, Canada, China, Czech Republic and Slovakia, Denmark, France, Germany, Greece, Hungary, Ireland, Italy, Kuwait. Norway. Poland. Romania, Russia, Sweden. U.K., USA and Yugoslavia. Furthermore there are negotiations for the radification of treaties with Egypt, Malta, Syria, Belgium, Finland and the countries comprising the Commonwealth of Independent States. The main purpose of these treaties is the avoidance of double taxation of income earned in any of these countries. For example, United Kingdom citizens may take advantage of the Double Taxation Treaty existing between the U.K. and Cyprus. This enables you to receive your pensions in Cyprus FREE of U.K. withholding tax. This Treaty is unique to Cyprus since it includes both public and private sector pensions. Recent tax reforms sharply reduce the tax burden in foreign residents, in recognition of their value to the economy. Individual non-Cypriots can choose to be taxed on a flat basis of 5 percent per annum on pension and investment income brought into Cyprus. For persons working in Cyprus, personal allowances free of tax is currently €11,000 per year. Consequently, the total tax burden on foreign residents is in practice often only 3 percent. This compares dazzlingly with competing destinations where property owners are subject to high tax exposure. From 1st May, 2004 Cyprus became a full member of the European Union is planning to adopt the Euro in 2007. European Union citizens who come to Cyprus can bring with them their furniture and personal effects, including car, without paying any VAT or import duties. This permit is easily obtained for persons living in Cyprus and who have purchased property. The granting of the permit is also based upon a very low level of foreign income available to support oneself and this refers to pensions or income from investments. For E.U. citizens this permit is no longer required. The banking system in Cyprus closely follows the British pattern. The banks have many convenient branches and they are efficient, modern and well equipped with the latest technology. Non-Cypriot citizens may open foreign currency and local deposit accounts without difficulty. Many international banks have branches throughout the island. Major credit cards, such as those within the Visa and MasterCard networks are widely used in Cyprus. Transactions and payments are simply made through your foreign deposit account. The legal system in Cyprus has been mainly based upon the British legal system. The Land Registry in Cyprus is probably the most advanced and reliable system in the world and is also based upon the British equivalent. Purchasers of property in Cyprus, therefore, will be far more secure, with regard to their title deeds, than perhaps they might be in other Mediterranean countries. All contracts and other legal paperwork can be in English. You should use an independent local solicitor. He will advise you, check the Title Deeds and ensure that the contract is correct. We can recommend a choice of lawyers should you wish. Your dog or cat can come with you to enjoy your new home in Cyprus provided that they have had all their vaccinations. The best part of all is that you dog or cat can be quarantined at your own home thereby avoiding the upset of 6 months at kennels. There are both junior and secondary schools in all major towns of very high standards, catering for English speaking students. The international schools achieve excellent "GCSE" and "A" level results. The schools accept day students and also have boarding facilities. Additionally, there is a college of higher education offering business studies, hotel management and many other courses. Language is another important consideration when one is considering living overseas. Cyprus was once a British colony resulting in over 90 per cent of the population speaking English. Clearly, this factor means that it is far less of a strain living in Cyprus than it would be in other locations in Europe. It is also useful to note that all street signs, direction signs and shop signs etc. are written in English. Greek is the mother tongue of the Republic, however knowledge of German, French, Russian and other languages is increasing with the tourist trade. The decision to purchase land and property for investment, a holiday home or a permanent residence is never easy, particularly in another country. Finding the right advice is the most important factor. Stephensons Estate Agents is a licenced and registered Estate Agent upon whom you can rely to give honest advice and opinions on design and workmanship, to provide the widest choice of location, the widest choice of property and the best value for money, combined with a professional after-sales property service. 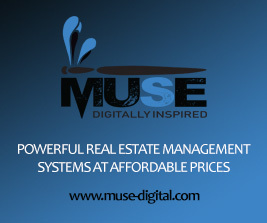 We can advise on lettings and management. 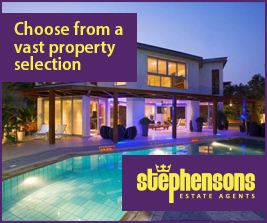 Compared to many countries buying property in Cyprus is very easy. European Union citizens are entitled to buy as much land or commercial property as they wish, although there is still a restriction to one residential property. Other non-Cypriots are entitled to FREEHOLD ownership of a villa or an apartment or a piece of land of up to 4,000 sq.m. If you are of Cypriot origin there are no restrictions. Prices start from around 18,000 pounds and upwards depending upon your requirements. Easy terms of payments and long-term finance schemes are also available. Foreigners are required to pay for property in foreign currency. Cash, credit cards, bank drafts and telex transfers are all acceptable. Using a company such as Foremost Currency Group can give you lower transfer costs and better exchange rates when compared with high-street banks. Setting up and account is easy: just click the link. Foremost Currency Group is one of the largest financial institutions dealing with the transfer of funds for home purchase abroad. You can use this company wherever you wish to buy in the world and be sure that you are getting excellent service and good value for money. Having signed a contract to buy property, it will be necessary to make an application to the Council of Ministers, a routine procedure, to grant its approval for non-EU citizens to acquire immovable property. Your solicitor can assist in the processing and monitoring of your application. If you sell, you can repatriate the funds immediately. In accordance with the legislation enacted in 2011 which amends the Land Transfer Fees law for any transfers of new properties until 31 December 2016, no property transfer fees will be imposed in the event where the real estate transferred is subject to VAT. In the event of transfer of buildings or part of them that are sold for the first time after the issue of their planning permission or building permit and the dates of both the conclusion of the sale agreement and the date deposited to the District Land Registry fall within the period that this law applies, land transfer fees are reduced by 50%. This is an annual tax on all property. Cyprus stamp duty is levied on 'documents' (i.e. written agreements/contracts) relating to assets located in Cyprus and/or matters or things taking place in Cyprus. Stamp duty is calculated on the value of the agreement at 0.15% for amounts exceeding EUR €5.000 but do not exceed EUR €170.000 and at 0.2% thereafter with a maximum cap of €20.000 per stampable agreement. The person legally liable to pay such stamp duty (unless otherwise stated on the agreement) is the purchaser. The due date for such stamp duty payment is within 30 days from the day of the ‘signing’ of a document which is considered to be subject to stamp duty. For those buildings for which an application for a town planning permit was submitted prior to the 1.5.2004 and for transfers of plots of land, no V.A.T. is charged in the event of an acquisition. For those after the above date, a V.A.T. of 18% is charged, but only once. So if you acquire a property for which V.A.T has been paid previously you will not be required to pay V.A.T. again. V.A.T is not added on the sales price for the purposes of calculating the property transfer fees. Implementation of the reduced VAT rate of 5% on the purchase or building of a permanent residence with effect from 1 October 2011. In the case where certain conditions are met by land developers (LD) and building contractors (BC) as well as by beneficiaries interested in purchasing property, the property disposal will be subject to the reduced 5% VAT rate. The qualifying residential property is used or is intended to be used by the beneficiary as his/her main and permanent place of residence. I.e., it does not matter whether the beneficiary is the owner of another property which is being used for other purposes e.g. as a rental or as a holiday house. If the LD or BC is not provided with a certified declaration (CD), at the time of submission of his VAT return, 15% VAT must be imposed. » At the time of submission of the declaration (on a form specially designed for this purpose), be 18 years of age. » Be a citizen of the Republic of Cyprus or of any another Member State of the EU and be a permanent resident in the Republic of Cyprus. » The intention must be to use the property for which the declaration is submitted as the main and permanent place of residence. » It must be intended for the property to be used after its purchase or construction as the permanent and main place of residence. Capital gains tax is levied at a fixed rate of 20% on both individuals and companies on gains arising from the sale of immovable property situated in Cyprus and sale of shares in a company, not listed on a recognized Stock Exchange, which owns immovable property in Cyprus . Therefore the important factor is the location of the property and not the residency of the owner. » Gift to a company where the company's shareholders are members of the donor's family and the shareholders continue to be members of that family for five years after the day of the transfer. » Gift by a family company, where all of its shareholders are members of the same family, to its shareholders provided the property was originally acquired by way of a gift. The property must be kept by the donee for at least three years.